We often talk about what a work adds to reality, but never about what it takes away from it. Before being charged with different meanings, a work also discharges reality. A work is firstly negative. Or let’s say it drills a hole in reality. This hole is then filled with all sorts of meaning: a work of art begins by diminishing the reality around it, then increases its potential. The great thing about Blair Thurman’s works is that they cannot be misinterpreted. They are sufficiently clear, even in how they are produced: thickly coated, clumsily painted canvases, roughly stapled to their stretchers – imbued with a sort of unifying treatment and tranquillity. The technique is never hidden, always apparent. You cannot go wrong with Blair Thurman: you just need to describe his works (i.e. look at them) to understand them. His work takes various forms – often paintings, or at least the traditional elements of a painting (stretcher, canvas). Some are hung up in the usual fashion; others are propped up against the wall, or displayed horizontally on trestles. Sometimes ‘tubes’ of hand-sewn canvas are attached to the wall, and rolled into a spiral on the floor. The first thing that strikes us about his approach is the power these various elements acquire when associated: the neon lights intensify or camouflage the colours of the painted surfaces; the paintings absorb or reflect the light; the space becomes saturated, and the perception of each part is indiscriminately altered by our perception of the whole. Sometimes the luminous tubes merely highlight elements painted on a panel. There is something totemic about their presence, as in Honey Badgers: a wooden screen covered in Amerindian motifs highlighted in coloured neon. This association offers an analogy (previously explored by Robert Indiana) between the totemism of native Americans and the repressed totemism of the consumer society (embodied by the identifying/ protective power of brands and their logos). 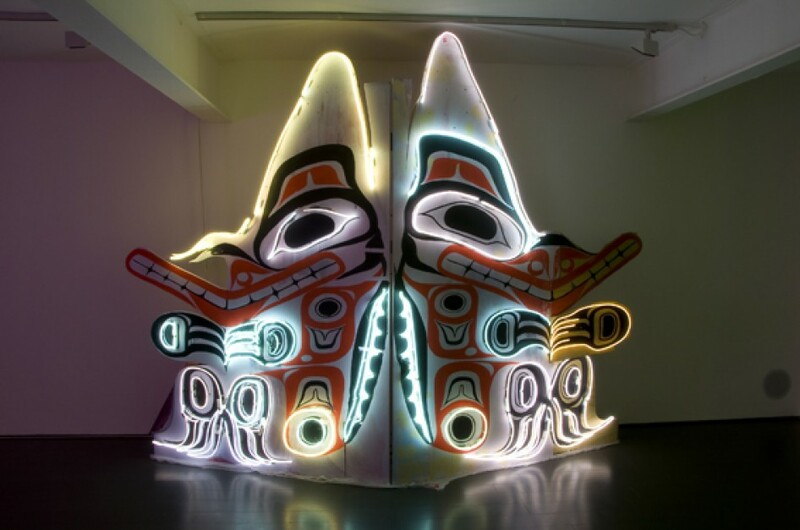 But such work also seems to evoke the ‘tourist-trap’ side to neon and Amerindian iconography.